Nicholls State opened on Sept. 23, 1948, as Francis T. Nicholls Junior College of Louisiana State University. In 1956, the Louisiana Legislature separated Nicholls State from LSU and authorized it to develop four-year curricula. In September 1956, the former junior college became Francis T. Nicholls State College and granted its first degrees in May 1958. 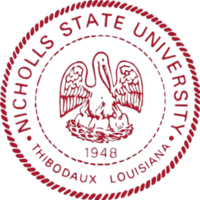 In 1970, Act 93 of the State Legislature changed the name of the institution to Nicholls State University. Princeton Review statistics from 2010 list the student-to-faculty ratio at Nicholls as 20:1. Admission has become selective. The average GPA upon entry is 3.2 with an ACT score of 21. The average GPA of Honors students is 3.6 with an ACT score of 26. Almost 62 percent of the student body are women; and nearly 3 percent are international students. As with nearly all academic institutions in Louisiana, Hurricane Katrina affected Nicholls' completion rate and overall ranking. During the aftermath of Katrina, Nicholls suspended its admissions selectivity in order to accommodate students from hurricane affected institutions. The university also had many matriculating students who were affected by the hurricane and did not return. The Department of Art is built upon a broad liberal arts foundation and preparation in studio disciplines required for careers in the visual arts and design. The Department of Art is accredited by the National Association of Schools of Art and Design. The Department of Mass Communication is one of five mass communication programs in Louisiana accredited by the Accrediting Council on Education in Journalism and Mass Communication (ACEJMC). The department offers two concentrations: journalism and public relations. Nicholls mass communication students and faculty employ three computer labs and a broadcast studio for learning and instruction in communication principles. Students within the department are also encouraged to apply for jobs with the KNSU radio station and student publications, helping to produce the yearbook or publishing the weekly newspaper, the Nicholls Worth. The University of Louisiana System has identified the following areas as Unique Areas of Excellence at Nicholls State University. These are areas of study that, because of either their unique classes or their leadership in Louisiana education, have been selected for this special honor. These include the John Folse Culinary Institute, Biological Sciences (Marine and environmental sciences emphasis), Nursing, Allied Health Sciences, Teacher Education, Accounting and Information Systems, and Child, Family and Social Services. Other notable degree programs include: Bachelor of Arts in Art, English, Mass Communication, and Music; Bachelor of Science in Geomatics; and master's degrees in Biology, Education, and Business Administration (in addition to an Executive MBA program). Nicholls is one of the first institutions in the United States to offer bachelor's degrees in Culinary Arts. Students gain expertise in both Cajun and French cuisine. The Chef John Folse Culinary Institute is the only American member of the prestigious Institut Paul Bocuse. Students also have the opportunity to earn a bachelor's degree in Culinary Arts and then work towards earning the MBA. Nicholls' faculty have been recognized nationally and internationally by the Phi Kappa Phi Honor Society, the National Science Foundation, the National Institutes of Health, the National Endowment for the Humanities, Phi Kappa Lambda, the Renaissance Society of America, and other organizations and associations. In the past three years, several faculty members have been awarded grants from the Louisiana Board of Regents. The university has the only certified public health geneticist in the South. Nicholls is also the home of the Louisiana Center for Women and Government, as well as the Dyslexia Center of Louisiana. Nicholls Online provides complete degrees online in a variety of disciplines. It offers over 100 online courses through its Division of Distance Education. Nicholls Online is different from regular online courses at Nicholls in that the courses are offered through 8-week sessions and have a unique fee structure. The Allen J. Ellender Memorial Library offers research assistance to the Nicholls State University community via 125+ databases and traditional reference books. The Library provides access to over 61,000 e-books as part of a collection of more than 245,000 books. Librarians provide library research instruction classes in all disciplines as well as individual consultation sessions. A leisure book collection with recent popular writers and 50 popular magazine titles is also available. The Library has both single and group study rooms for patron use. There is also an interlibrary loan service which acquires materials from other libraries, and a courtesy card service that allows patrons to check out materials from other Louisiana universities. Ellender Library, through its Government Information Department, has been a selective depository for Louisiana state government publications since 1960 and a selective depository of the U.S. Federal Depository Library Program since 1962. The Library is a congressionally designated depository for United States government documents. Public access to the government documents collection is guaranteed by public law (Title 44 USC). In its role as a depository, Government Information houses an extensive collection of books, periodicals, microfiche, maps, CDs, and kits published by Louisiana state and federal agencies on a wide array of topics such as health, geology, military history, law and legislation, education, statistics and more. The Archives and Special Collections Department of Ellender Memorial Library is the archival repository for the historical records of the university and serves as a repository for primary and secondary material relating to the geographical, historical and cultural uniqueness of the region. The collections include personal papers, business and organizational records, historical photographs, literary manuscripts, maps, diaries and scrapbooks. Newspapers, oral histories, and numerous other formats are also represented. Many collections document the plantation era and the sugar cane industry. The Archives and Special Collections Department is also home to the library’s Regional, Rare Book, and Genealogy Collections. Nicholls sports teams participate in NCAA Division I (Football Championship Subdivision or FCS for football) in the Southland Conference. Nicholls' colors are red and gray and the athletics teams are nicknamed the Colonels. The Nicholls State University Department of Athletics currently sponsors men's intercollegiate baseball, basketball, cross-country, football, golf and tennis along with women's intercollegiate basketball, cross-country, softball, soccer, tennis, track and field (indoor and outdoor) and volleyball. Nicholls' official athletics mascot is Colonel Tillou. The modern version wears a bright red uniform topped off with a contemporary-style military officer's cap. The Pride of Nicholls is the marching band which represents the university. The band performs pregame and during halftime at all Nicholls Colonels home football games, selected away games and in exhibitions at selected marching festivals during the fall semester. Nicholls' primary athletic rivals are Southeastern Louisiana University and Northwestern State University. ^ a b c "Preliminary Enrollment Survey Headcount Enrollment Survey Summary". Louisiana Board of Regents. September 2017. Retrieved 2017-12-26. ^ "Humble president celebrated at Nicholls' 1st Inauguration". The Daily Comet. Retrieved November 20, 2014. ^ "Clune Named President at Nicholls State University". usnews.com. Retrieved January 12, 2018. ^ "GPA of Honors students". The Princeton Review. ^ "Department of Mass Communication Office Site". Retrieved March 1, 2013. ^ "Nicholls State University Report: Economic and Community Impact Study" (PDF). University of Louisiana System. Retrieved November 20, 2014. ^ "Louisiana Center for Women & Government at Nicholls State University". Nicholls State University. Retrieved June 27, 2012. ^ "Nicholls Online Degrees". Retrieved August 23, 2017. ^ "Division of Distance Learning". Retrieved March 1, 2013. ^ "Archives and Special Collections at Nicholls State University". Retrieved December 9, 2015. ^ "Colonel Tillou". Archived from the original on March 6, 2012. Retrieved March 18, 2013. ^ "New mascot at Nicholls State under fire". Content.usatoday.com. 2009-08-20. Retrieved 2015-08-28. ^ a b "The Pride of Nicholls Marching Band". nicholls.edu. Archived from the original on 2010-05-27. Retrieved 2013-01-20. ^ "Nicholls State Marching Band". U.S.News & World Report. Archived from the original on 2014-03-08. Retrieved 2014-03-06. ^ "Nicholls State University-Band". prezi.com. Retrieved 2014-03-08. ^ "Anthony J. Guarisco, Jr". martindale.com. Retrieved June 24, 2013. ^ "Francis Heitmeier's Biography". Project Vote Smart. Retrieved April 22, 2015. ^ "Sam Jones". Project Vote Smart. Retrieved April 17, 2015. ^ "Representative Jerome "Dee" Richard's Biography". votesmart.org. Retrieved August 28, 2013. Wikimedia Commons has media related to Nicholls State University.